Anna Atencio wasn’t planning to come to Carolina—until she learned about the Chancellor’s Science Scholars Program. As part of the Chancellor’s Science Scholars program, Anna Atencio spent her summer at the UNC Institute of Marince Sciences. 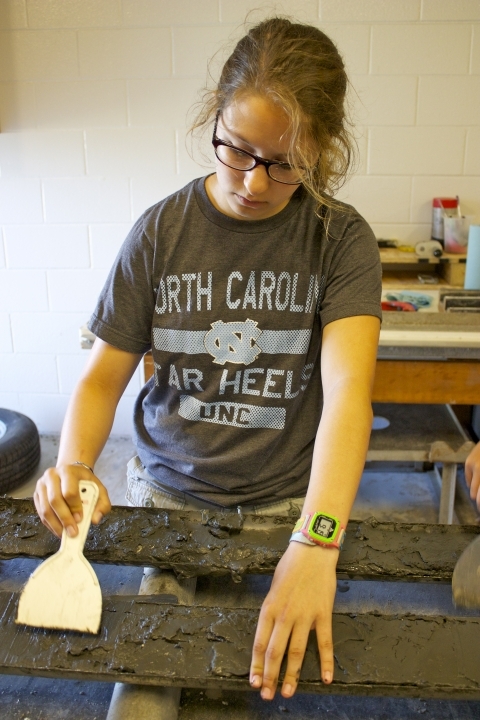 Here, she smooths out a sediment core sample in the Rodriguez lab. Atencio is now a sophomore at UNC, majoring in geochemistry with a minor in marine science. She is also a member of the first class of Chancellor’s Science Scholars, a new scholarship program that awards $10,000 per academic year to undergraduate scientists planning to pursue a masters or PhD in their chosen field. But Atencio almost didn’t come to Carolina at all. While attending the North Carolina School of Science and Mathematics, Atencio was certain she wanted to go to NC State and major in engineering. The daughter of an aerospace engineer, she was eager to follow in her father’s footsteps. “I was really influenced by him and his job, so I didn’t really consider other options at that time,” Atencio says. But she still applied to multiple schools, and a few months later a letter came from UNC, offering her a spot in the Chancellor’s Science Scholars Program. Atencio started thinking about possibilities outside of engineering. She talked to her parents about her options, and they encouraged her to accept the scholarship from UNC. If she didn’t like the program or UNC, they said she could always transfer the following year. In addition to making friends, Atencio and the other scholars worked together to get into the swing of research on campus. Atencio quickly found a home in Brent McKee’s lab in the Department of Marine Sciences, where she’s currently studying how oyster reefs and marshes are reacting to sea-level rise. She’s collecting data on how fast marsh grasses are growing and how much carbon they sequester. “If the marsh doesn’t grow fast enough to keep up with sea-level rise, then the grasses drown and all that carbon goes back into the ocean,” Atencio says. That influx of carbon leads to warmer surface temperatures in the ocean and contributes to the greenhouse effect. When McKee asked Atencio if she’d like to spend the summer studying at the Institute of Marine Sciences in Morehead City, Atencio said yes immediately. “I really enjoyed the fieldwork—taking the boats out and collecting the cores,” she says. “I had been working with these cores for about a year prior to this summer, but I had never seen them collected, so I was excited to see how the process works.” The cores Atencio refers to are long columns of mud that researchers extract from marshes to gain information about the health and age of the marshes.